This is our family portrait and Christmas card picture. Every dog in this picture is the result of your dedicated volunteers and hard work. 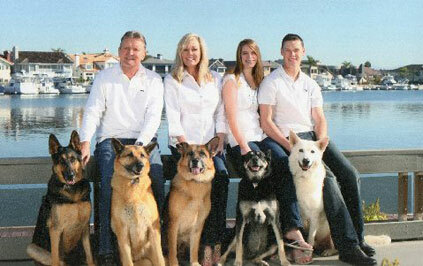 Each and every dog in our family was adopted from GSROC and they are treasures to us. The beautiful boy on the right is our Grand Dog Riley with his Mom and Dad (our Daughter and Son in Law) and the four to the left are our babies with us. We cannot thank you enough for all you do. We wish you a Merry Christmas and thank you so very, very much for our furbabies….